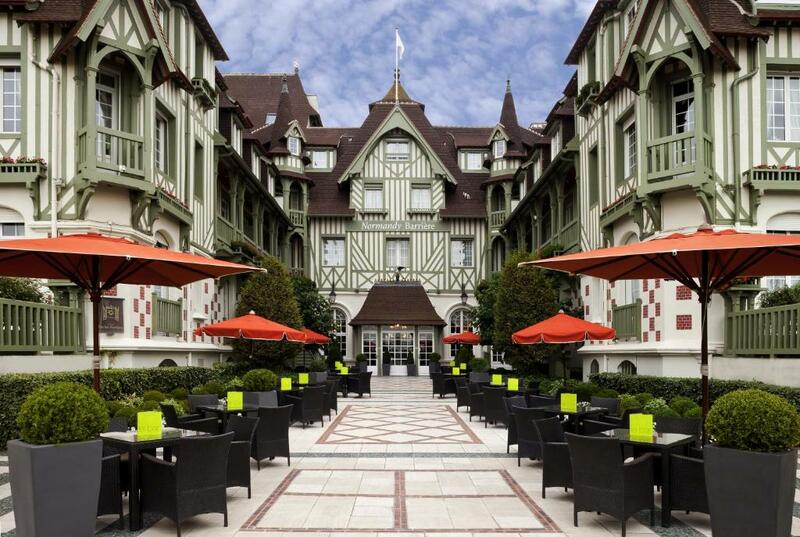 Lock in a great price for Hôtel Barrière Le Normandy – rated 8.8 by recent guests! 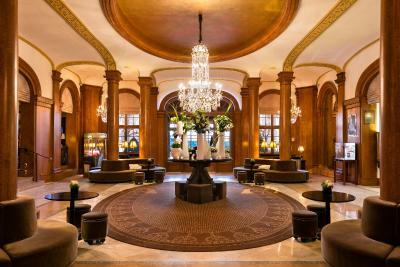 Stylish, beautifully renovated historic hotel in an excellent location. Sunday brunch was superb. 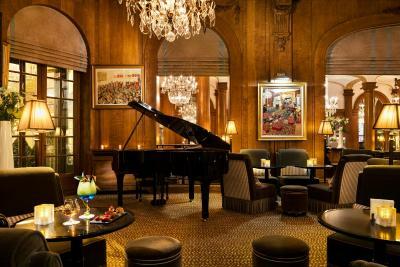 Slightly old fashioned (in a good way) and a wonderful hotel. Friendly and accommodating staff. Excellent location. The kindness of the staff. The Wagyu Club sandwich. The view from the balcony (room 223). 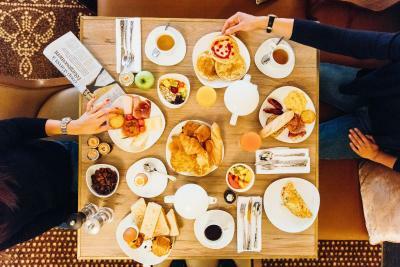 Splendid in room breakfast ! The hotel which is just a fantastic place where to stay in Deauville. 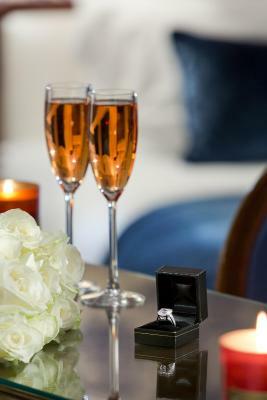 Location, luxurious details, service all top notch. Everything about the hotel was perfect. Very good breakfast, easy check-in and check out. Very good recommendations from the concierge. Excellent service, super meal in restaurant. Pool is very good. Good pillows. Nice waiters in bar. Good hot chocolate. 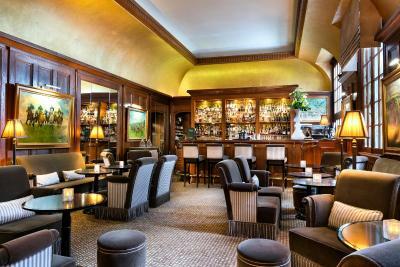 One of our top picks in Deauville.With an Anglo-Normand style, Hôtel Barrière Le Normandy Deauville offers dining in the restaurant or on the terrace, with views of the private garden. 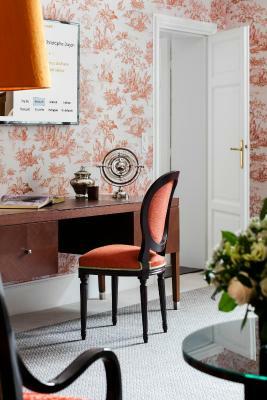 The individually decorated rooms at Hôtel Barrière Le Normandy Deauville are equipped with satellite TV, a safe and WiFi access. 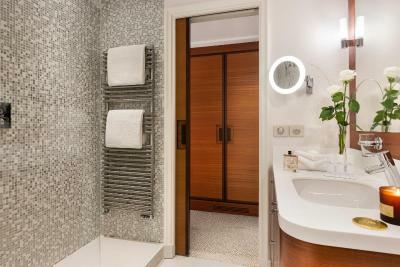 Each room has a private bathroom and is serviced by a elevator. 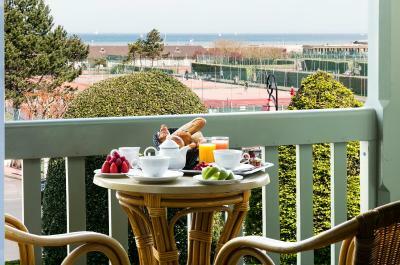 A continental breakfast is prepared every day and La Belle Epoque restaurant serves regional cuisine. There is also an American bar on site. 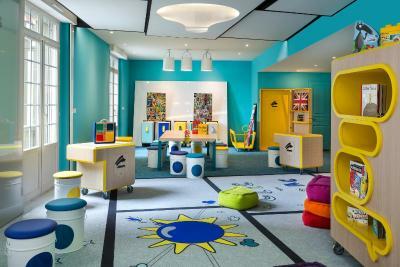 During school holidays, the "Studio by Petit VIP" welcomes children between 4 and 12 years old and offers several activities. A nursery is available on site and welcomes children aged 3 months to 3 years. Children also benefit from a unique gourmet catering. 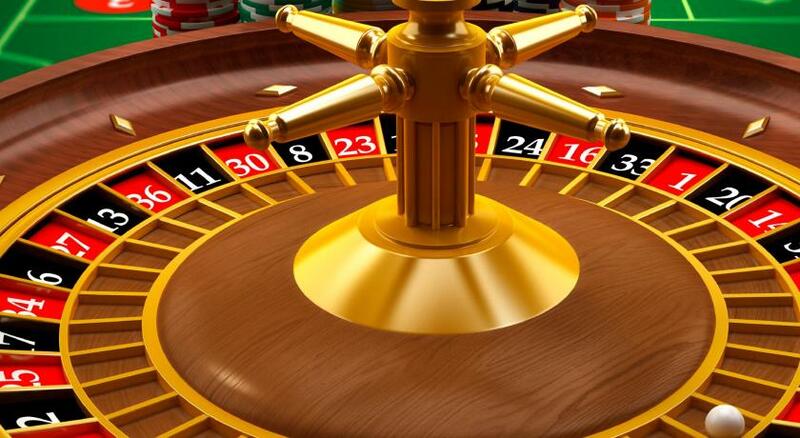 The hotel is ideally located just a 2-minute walk from Les Planches Promenade and 650 feet from Deauville Casino. 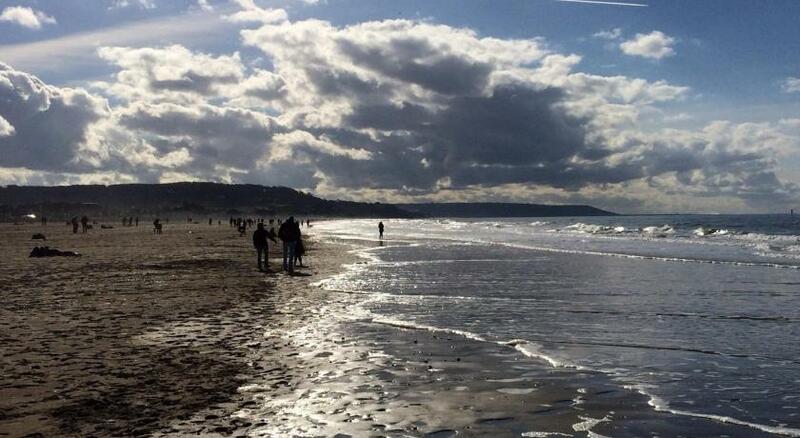 It is also 1 hour from the D-Day landing beaches and private parking is available on site. A large range of luxury shops can be found in the area. A charging station for electric cars is available at this property. 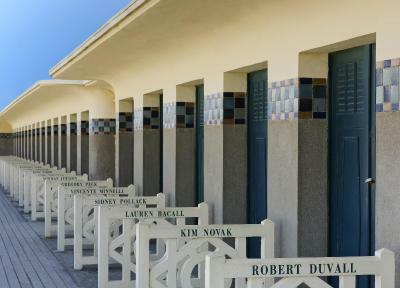 This is our guests' favorite part of Deauville, according to independent reviews. 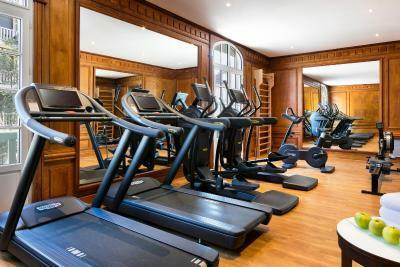 This property also has one of the top-rated locations in Deauville! Guests are happier about it compared to other properties in the area. 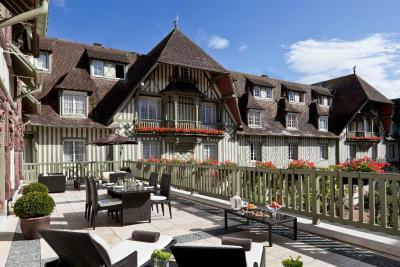 When would you like to stay at Hôtel Barrière Le Normandy? 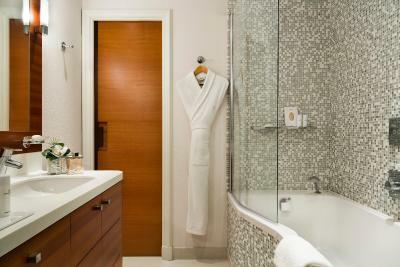 This superior room includes a bath and overlooks the city or the hotel's indoor pool. 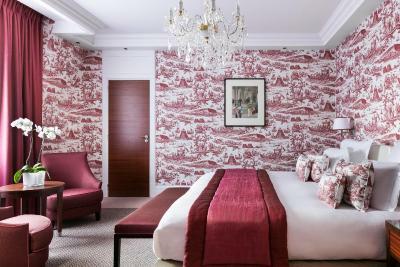 It is decorated with Toile de Jouy. 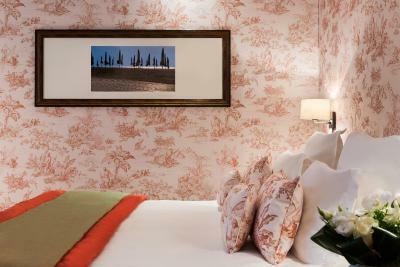 This spacious room has a view over the town, the courtyard or the apple trees in Francois André square. Some of these rooms have a balcony. It can accommodate an extra bed at an additional cost. Spacious apartment overlooking the courtyard or the town. Each apartment offers 2 bedrooms and 1 bathroom. 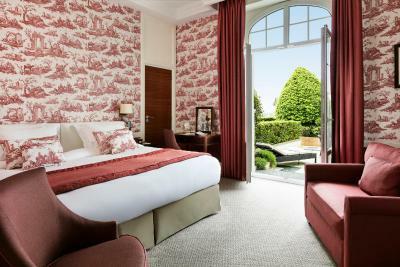 Elegant suite with a view of the town or the courtyard. It offers a seating area and a bath. 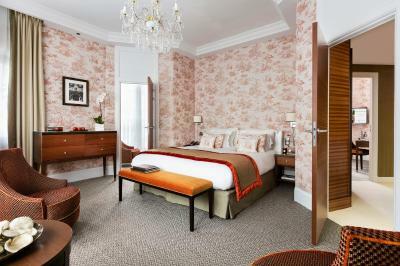 This room can accommodate at an extra bed, at a surcharge. 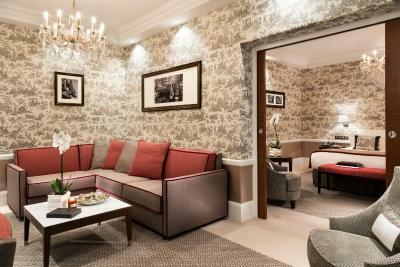 This elegant suite features air conditioning and a seating area. The rooms have either a sea view or a terrace. 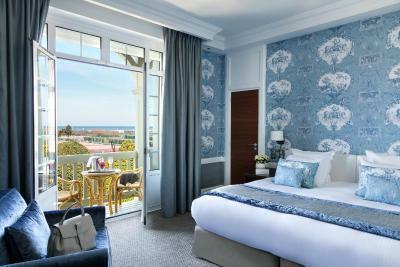 This elegant suite features sea views or a terrace. It includes a large bedroom and a separate living room. 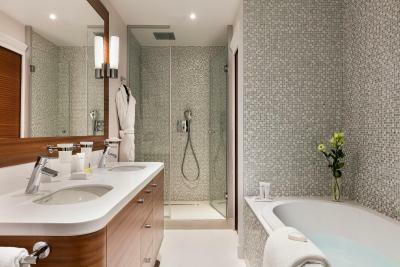 With a view of the sea, this luxury room features air conditioning and a bathtub. 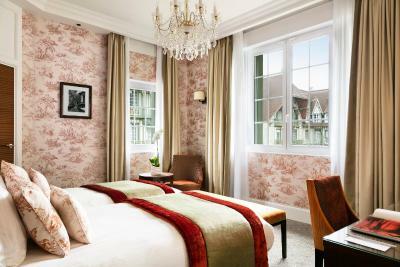 Overlooking the hotel’s courtyard with wisteria and apple trees or the town, this suite features a bedroom, a separate living room with a desk and a bathroom with a bathtub. 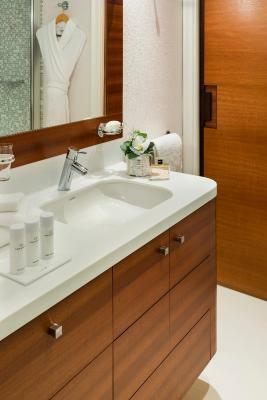 Suite "un homme une femme"
This spacious and elegant suite faces the sea. 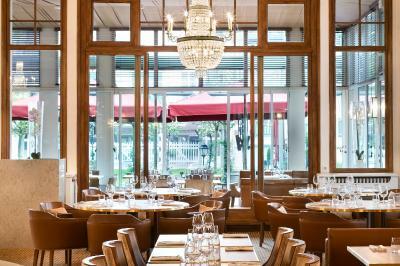 The original décor has been inspired by a French movie. 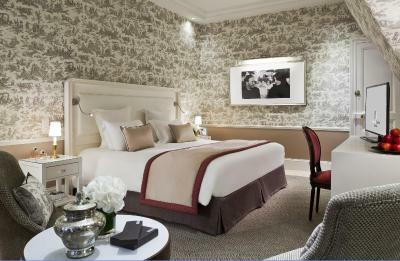 This luxurious room has air conditioning and a private terrace with loungers. 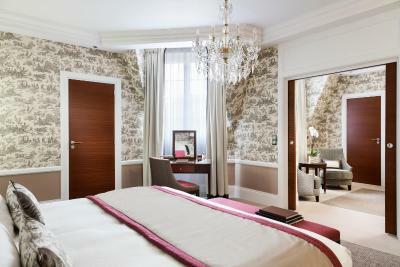 Overlooking the courtyard, this suite includes a large bedroom, a spacious lounge and a dressing room. This luxurious room features a town or courtyard view. It offers air conditioning. 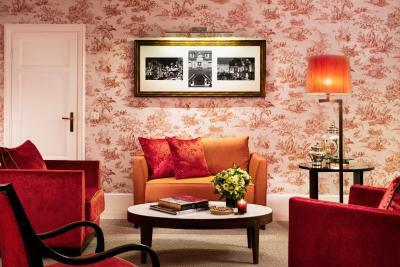 This Suite features a living room with sofa bed. It provides views of the courtyard or the harbor. The Spa Diane Barrière offers a concept of well-being, for total regeneration. Offering relaxation, regeneration, revitalisation, detox and beauty, you’ll find the right solution for you at this wonderful spa, the only one of its kind in France. Come and try out these exceptional new experiences - our team and facilities are at your service. 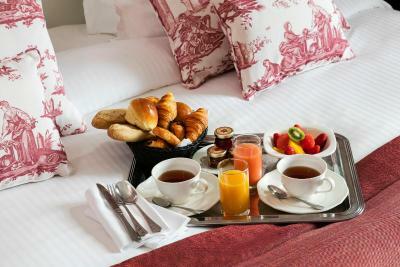 House Rules Hôtel Barrière Le Normandy takes special requests – add in the next step! 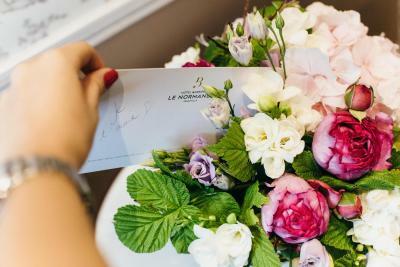 Hôtel Barrière Le Normandy accepts these cards and reserves the right to temporarily hold an amount prior to arrival. 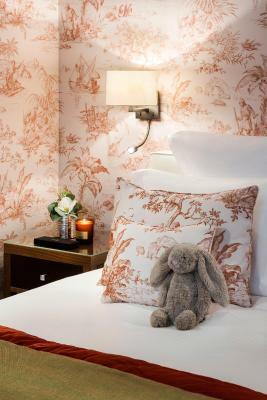 Please note that the hotel's nursery welcomes children aged 3 months to 3 years and the ""Studio by Petit VIP"" children from 4 to 12 years old. Too many kids but it’s normal for this hotel at that time of the year. The room was small, reception people were unprofessional , the Pool and SPA were not to the standard. i liked the location and restaurant. Not much, perhaps cheaper car garaging. A little on the pricey side, but not excessively so. Hideous clientele. Insane interior decoration depressing breakfast. Incredibly expensive 1000 euros for 2 nights. Room was wonderful and extremely comfortable and the hotel caters for vegetarians ! Alas we had to move room twice the day we arrived; there were no window coverings to restrict light ingress in the first room and in the second room, the air conditioning was faulty. Having said that, our ultimate room came with the ultimate room upgrade in respect of which we were shocked but very grateful!